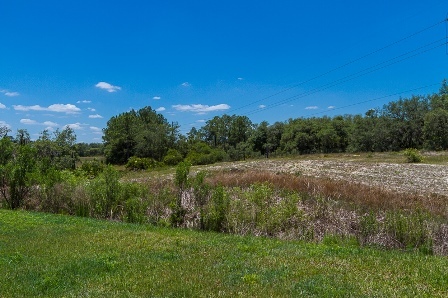 Situated on the prestigious, gated community of Grand Reserve, this outstanding home enjoys a private extra large plot, overlooking conservation to both the front and the rear. 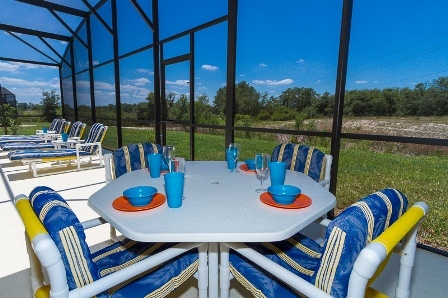 This home is the perfect, peaceful place to relax with your very own South facing pool & spa to take in the views and the wonderful wildlife from our extended deck. Luxurious 4 Bedroom, 3 Bathroom home with 2 masters ensuites, 2 Living areas, fully furnished and equipped to an exceptional high class standard. Safe available for guest use. The master bedroom has a King size bed, 46'' Flat screen TV. Ceiling fan, Telephone and patio doors leading out to the pool deck. There is a large walk in closet and luxurious en-suite bathroom, with seperate WC, double vanity unit, large walk in shower and corner bath. 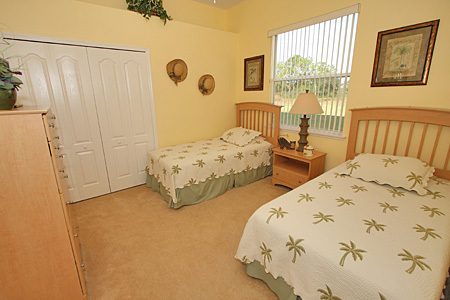 The second master bedroom has a King size bed, 42'' flat screen TV, ceiling fan. 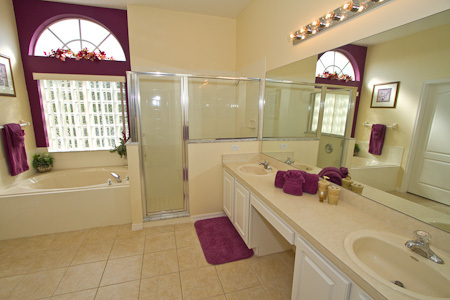 The adjoining bathroom has WC, vanity unit and large walk in shower. 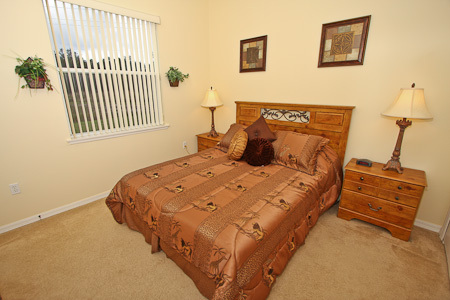 The third bedroom has a queen size bed 32'' flat screen TV and ceiling fan. 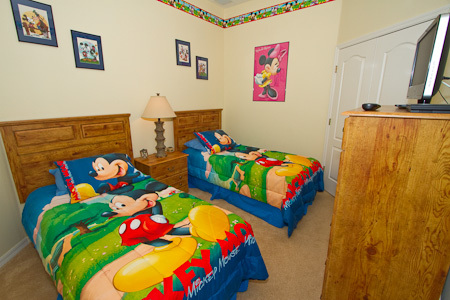 The fifth bedroom with twin beds can be found to the front of the home, next to the Master bedroom. The 'Den' has a 42'' flat screen TV, Xbox one S, Playstation, numerous books and games. There is also a double sofa bed. 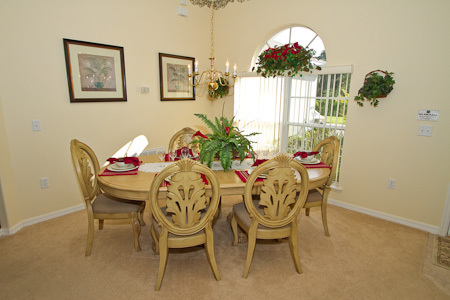 With a large gourmet kitchen, a breakfast nook and formal breakfast area guests have plenty of choice of dining arrangements. Complete with oven, hob, microwave, dishwasher, large fridge/freezer with ice maker, crockery, pans, cutlery etc. The adjoining Utility room has a Washing machine, Tumble Dryer, sink, iron & ironing board. 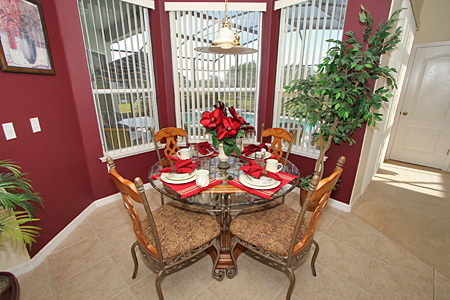 The Dining Room & Lounge area has patio doors leading out to the pool deck. The spacious Family room has a 58'' flat screen TV, with sound bar, telephone, with Patio doors leading out to the pool deck. The fantastic, south facing Pool, Spa & oversized deck overlooks a small pond and conservation area. It has 4 loungers, 2 recliners, patio table & 4 chairs and bar table with 2 chairs. 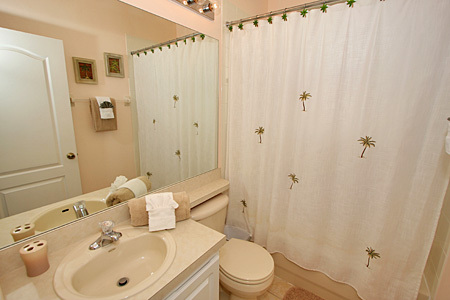 Air conditioning & Free Wireless internet is available throughout the villa and free local, USA & Canadian calls. A Table Tennis table and Pool Table are available in the Garage. Our second year staying at this amazing villa and once again = perfection! Had a wonderful time and the weather was perfect..Sunshine every single day for three weeks! The peaceful surroundings, the pool area, the natural views make for a truly relaxing vacation. The villa is clean and has everything that you would ever need. The owner, Bev, is a delight to book with - always prompt with responses to any questions. The only bad part of our stay was having to leave!! Highly recommend. Another excellent stay at this perfect villa! Stayed over Christmas and new year 2014/15. Our second time at this villa. Last time was Christmas 2012. Very easy to get to, in a great location not far from the attractions. Great information from Bev the owner prior to our stay i.e where to shop, best restaurants etc. 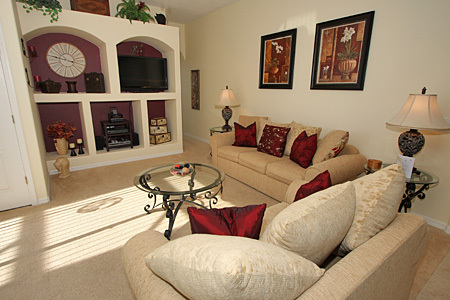 Villa is amazing, spacious, clean and had everything we wanted. Great to relax in the Jacuzzi after a long day at the parks. Love this villa and will definitely be booking here again next time we are in Florida. Another Great Stay at Grand Reserve ! We have just returned from our second stay at Grand Reserve (10th - 24th August 2014), and it was definitely as good as the first time we stayed there in 2011. We find the owners very easy to deal with, and any questions we have are always answered promptly. Directions to the villa, key codes and any other instructions are always emailed to us well in advance of our trip, so there is no last minute panic. 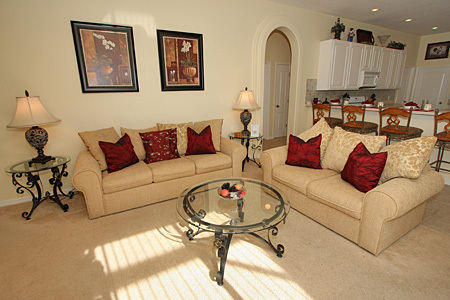 Grand Reserve is just like a "home away from home" with absolutely everything you will need for a relaxing holiday. The interior is spotlessly clean and very well maintained. The pool area is very spacious with plenty of seating and the pool is large and very clean. The pool area overlooks a pretty conservation area. 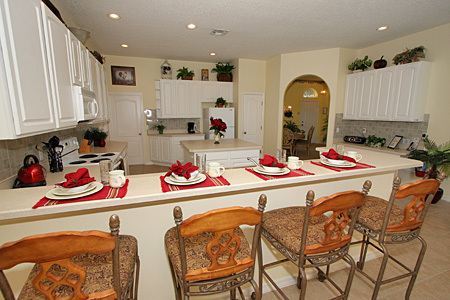 We enjoy staying at Grand Reserve as it is a very peaceful residential area, but local amenities are very close by, with a Publix supermarket only a five minute drive away, and restaurants such as Fridays, Chilli's and Olive Garden, only a 10 minute drive. All the Disney attractions are only a 20/25 minute drive. We would not hesitate to recommend this villa, and it's owners - and have already booked with them again for 2015 !! Having just returned from our holiday I can only describe the villa and the service provided from Bev the owner as fabulous. The villa is on a lovely plot overlooking a lake / conservation area to the rear. We even saw a Bob Cat early one morning. The villa itself is beautiful and has everything you need. We spent many a night in the games room or lazing by the pool. The local supermarket is only o few minutes drive, where you will also find food outlets, some that will deliver if you need a rest after a day at the parks. Being football fans this villa also had the added bonus of providing premier league football which was greatly appreciated with the 12 year old in our party. All in all the best villa we have stayed in, in our 10 plus years of visiting Orlando. We had a fabulous holiday in this beautiful villa. The property, location and specification were perfect for us in every way. 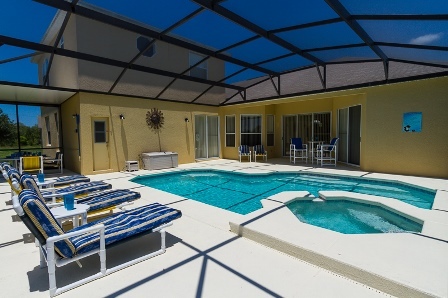 Bev could not be more helpful and is an absolute pleasure to deal with.. this was our third visit to Orlando but the Grand Reserve property made this our best "American dream" holiday yet. Many thanks to Bev. We will return soon. The Villa for the greatest holiday experience. Do not look any further this is the place. Take nothing as every thing except food is there. The pool is amazing and very welcome after a day at the parks. Just a couple of miles up Old Lake Wilson road is the 192. This is just wall to wall restaurants. The Outback takes a lot of beating with IHOP a close second for breakfast. The service from the property team was superb as the washer broke down and the guys fixed it in two hours. Let me be clear we have spent many holidays in Florida but this accommodation surpasses any. Need any info Bev Dore the owner is very helpful. FIRST TIME IN FLORIDA SO WAS VERY APPREHENSIVE ABOUT BOOKING FLIGHTS, VILLA, TICKETS AND CAR HIRE SEPARATELY. CHOSE THIS VILLA BECAUSE OUR PARTY CONSISTED OF 3 FAMILIES, 2 ADULTS + 2 CHILDREN, 2 ADULTS + 1 CHILD AND THE TWO GRANDPARENTS. 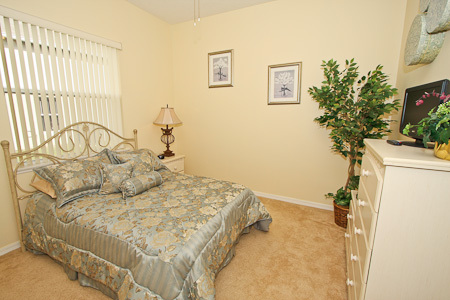 THE ROOM COMBINATIONS AND WHERE THEY WERE SITUATED WERE PERFECT FOR THE FAMILIES. THE KITCHEN/LIVING AREA WAS THE MAIN HUB WITH PLENTY OF SPACE (SO NO-ONE GOT IN ANYONE'S WAY!). ON ARRIVAL (BEV'S DIRECTIONS WERE PERFECT), THERE WAS CERTAINLY THE WOW FACTOR AS WE WALKED THROUGH THE DOOR, VERY HOMELY AND WELCOMING. SPOTLESSLY CLEAN AND 'JUST AS IT SAID ON THE BOX'. ALL BEV'S DIRECTIONS FOR VARIOUS PLACES WAS A GODSEND. WE HIRED A BARBECUE THRO BEV WHICH WAS GREAT AS WE DO NOT LIKE EATING OUT TOO MUCH. LOVELY TO SIT OUT ON THE LARGE DECKING AREA IN AN EVENING WITH A DRINK OR EVEN EARLY BREAKFAST ON THE WARMER DAYS. DECKING AREA ALSO BEING VALUABLE WITH CHILDREN AS THERE IS PLENTY OF SPACE AROUND THE POOL. WEATHER WAS IN EARLY/MID 70'S AND PLEASANT (MAKE SURE YOU USE SUNCREAM EVEN WHEN IT'S CLOUDY!!) BUT GLAD WE HAD THE POOL HEATED. MAKE SURE YOU DO THE BULK OF YOUR HOUSEHOLD SHOPPING AT WALMART AND NOT PUBLIX! 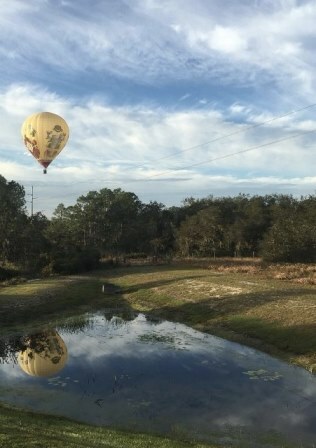 HAVING ONLY 2 WEEKS AND WITH SMALL CHILDREN, WE ONLY AIMED TO COVER MAGIC KINGDOM, ANIMAL KINGDOM, WATERPARKS, SEAWORLD, AQUATICA AND BUSCH GARDENS. THIS WAS VERY TIRING SO HAD A COUPLE OF BEACH DAYS AT CLEARWATER AND COCOA. IT WAS A RELIEF TO COME BACK TO HOME COMFORTS AT THE VILLA WHICH WAS VERY RELAXING. OLD TOWN ON A FRIDAY/SATURDAY NIGHT IS A NICE RELIEF AND SOMETHING DIFFERENT WHERE THERE IS A MINI FAIR AND THE HIGHLIGHT BEING A PARADE OF OLD VINTAGE CARS BEING DRIVEN BY THEIR OWNERS, SOME OF WHICH ARE WELL COSTUMED UP. MUST MAKE THE EFFORT TO SEE THE FIREWORKS ONE NIGHT AT MAGIC KINGDOM AT 10PM, WORTH THE LATE NIGHT AS YOU MAY NOT GET BACK TO VILLA UNTIL AFTER MIDNIGHT. THE LOCATION OF THE VILLA ON GRAND RESERVE WAS ALSO VERY QUIET AND PEACEFUL AND PEOPLE IN THE NEIGHBOURHOOD WERE VERY FRIENDLY. WOULD HAVE NO HESITATION WHATSOEVER OF RECOMMENDING THIS VILLA AND/OR THE SERVICES OF BEV WHO WAS ALWAYS AT THE OTHER END OF EMAILS FOR ANY QUERIES I HAD, EVEN WHEN SHE WAS ON HOLIDAY. ENJOY. This was our second time staying at this villa, definately won't be the last as we love it so much. last time we brought our children (now adults), this time their friends came and all had a wonderful time. So much space, very clean and has everything you need. Wonderful location, if we win the lottery, were booking this villa for all of 2014!! Thanks Bev, for your continuous friendliness and fantastic customer service, look forward to booking with you again. Having stayed in Orlando several times at before at a different villa we decided to try this one as we had visited friends that were staying on Grand Reserve the previous year and liked the look of the place. As soon as we entered the villa we loved it. It is luxurious with a really cosy feel. It has everything you could possibly want from a Villa. My husband and son especially loved the free wi fi, table tennis in the games room and the Fox Soccer Channel!! We had never been to a villa that showed the premiership games live before!! It sometimes made us late when going out but it was lovely. The pool deck area is huge and the spa is fantastic. It was so lovely to be sitting in the spa on New Years Eve!! It is close enough to the parks, with a huge Publix supermarket just up the road. Everything is so convenient. The villa is so lovely we couldn't wait to get back to it after some long days out! We visited the Chilis restaurant on Bev the owners advice and took a cab too as they did 2 for 1 drinks!! This was my favourite visit to Florida so far and I couldn't praise the villa or the help and advice we received from Bev enough. 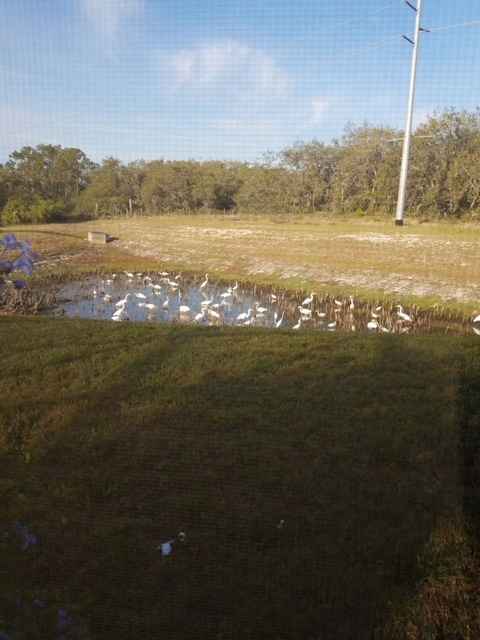 We would have loved to stay longer and will definitely not be looking to go anywhere else on our next visit to Florida. This villa is 10 out of 10 absolutely loved it!! definitely go back to Grand Reserve if we ever have the chance. Rob Tappenden & family June 2012. What a great holiday we have had, the weather was fantastic and the villa was even better than we had thought. The villa was in a very peaceful area with Champions gate just down the road with golf courses and restaurants. The Villa was much bigger than we thought and even with 9 of us staying, we never got in each others way. The pool was fantastic, we had it heated for the 2 weeks so we could use it at night after a long day at the parks. Just down the road is a large Publix super market with all the essentials, this was rather handy, especially for beer. Bev the owner kept contact with me the whole time we were there, she gave me all the directions and all the other usefull info before we went. She puts customer care in another league. The parks are only 10 mins down the road with easy access via the 192. The 192 is where we ate quite a lot too, as there must be over 40 restaurants spread up and down it. I cannot say enough good things about this villa, we have had the best time and i would like to Thank Bev and Larry for being the perfect hosts. If you are looking for the perfect villa, then look no further! The moment we arrived and stepped inside Grand Reserve, we knew we had chosen the best. The layout was excellent with plenty of space both inside and out, each room is of generous size with great attention to detail paid to the decor and furnishings, it really was immaculate. Upon arrival the villa was in superb order, very clean and presented to a high standard. Grand Reserve's location was ideal, just a short drive away are the Disney Parks and various other attractions and Publix supermarket is just around the corner, which is very handy! 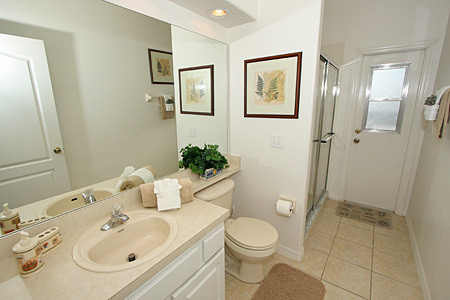 It is a very quiet community, with bags of privacy and very friendly residents. The management team are local and provide a brochure of hints and tips to ensure you have all the relevant information for your stay, if you require anything, they are only a phoneall away, which is very reassuring! and all of the appliances were clean and easy to use. 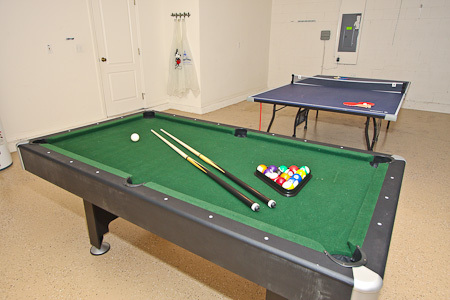 The games room is a great use of space, providing entertainment for both the adults and children! TIP - Hang your wet clothes & towels up in here. At times it looked like a chinese laundry room in there, but they were all dry within hours! The extended pool deck and pool was just amazing, very clean and a lovely place to relax, both during the day and at night. 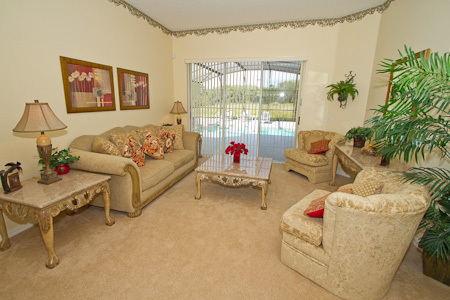 Poolside furniture is provided and there is plenty to go around! With no property overlooking the rear, you get a real sense of absolute privacy. You really wont be disappointed with Grand Reserve or the fantastic service you will receive from the Owner Bev from start to finish. Bev, I really cannot thank you enough for your fantastic communications and advice both prior to, during and after our stay. Your home is a beautiful one, sincere thanks to you and your team for making our holiday the best one ever! I best start saving because we will be coming back!! A lovely holiday and a brilliant Villa the best we have been in over three visits to the US. The pool was fantastic, struggled to get the kids out of it. The location, standard of the Villa and helpfulness of Bev the owner were second to none. We would recommend to anyone. We would just like to say how much our family enjoyed our stay at your lovely home in Davenport. The villa was immaculate on our arrival and the personal call from Bev to make sure we had found everything we needed was just excellent customer care. The layout was ideal for our 3 generations, my husband and I in one end of the villa, our sons in the middle and Grandma at the other end - it was as if we all had our own seperate wings and precious personal space! The pool and kitchen/family room are what brought us all together. The pool was a joy at what ever time, day or night we decided to have a swim. Great after long days in the heat of the parks. It was lovely to see the unusual birds ambling around the villa and the secluded view of the countryside. My son loved seeing the gekos. Thanks for giving us the opportunity to share your home. Holidays are so important and staying here ensured we had many happy memories to take home with us. We stayed here for two weeks in August 2010, house was perfect and we would recommend it to anyone looking for space and luxury with a feeling of a real home, the house is immaculately decorated, plenty of towels etc, all the furniture is of a high standard, we can't wait to go back next year! Great location near enough to the parks but far enough away to relax. 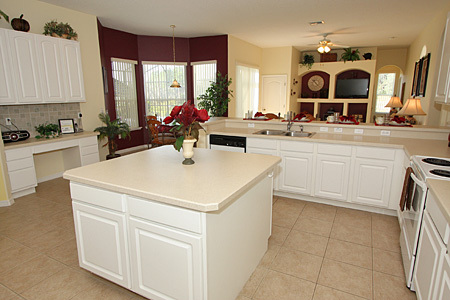 In short it is the best house we have stayed in, in Florida and we would recommend it to anyone. The drive from the airport was so easy,very straight forward instructions from Bev the owner allowed us to arrive at least 6 mins.before satnav members of our party. On entering the villa, each family member had an open mouthed couple of minutes as all took in the outlay of this fantastic home From the Kitchen to the dining,sitting and sleeping area,s the care and quality used in this home is evident. It is ideally situated with all parks within easy reach and shops and diners to suit all tastes not far away. We had our grandsons with us,the eldest 9 and the youngest 4 who made use of the swimming pool a daily event .But then so did we all seeing that during our stay in June 2010 our coldest day weighed in with 31 deg.C.The villa became our haven away from all the hustle and bustle and I would not hesitate to recommend it or the owner to anybody. 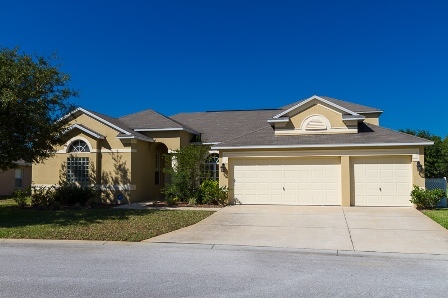 This was the first time we have stayed in the Davenport area, we have stayed in five homes around Kissimmee over the last 10 years and this house was by far the best. It was extremely clean, comfortable and well managed and in a great location close to the supermarket and 15 / 20 minutes form the attractions. The pool was great, especially when heated and there was shade around it when needed. The pool deck was in excellent condition, both clean, free of cobwebs and the wire mesh around it had no holes in it unlike all the other properties that we have stayed at. It was great seeing and hearing local wildlife. The house was huge, there was 4 of us and we all had our own area in there without being disturbed. Overall, we had a fantastic time and would highly recommend staying in this property, the owner is extremely friendly and helpful and responds to enquiries super fast. Only downside was having to come home to the UK :( Don't hesitate, book it now before it's too late, we might just get there before you!